The recent school shooting in Parkland, Florida, terrible tragedy that it was, also ended up bringing to the fore something positive that is sorely lacking in many of today’s young people: a mission. 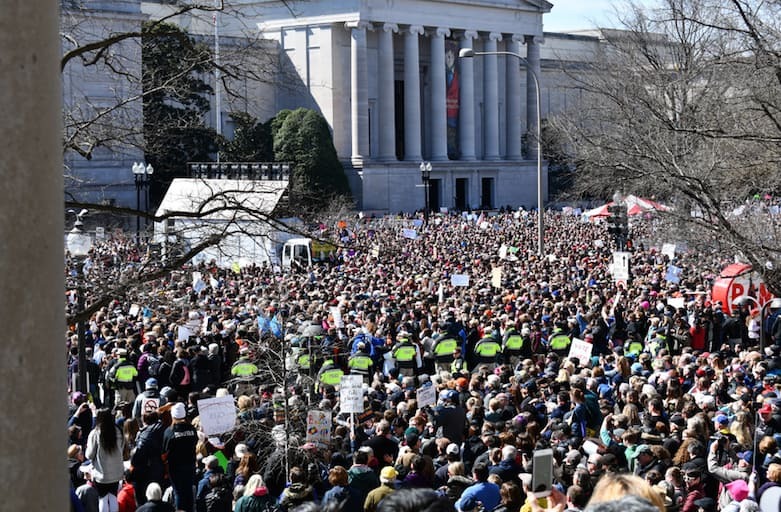 Although I wish it weren’t mass shootings that were the reason, the way students around the world rallied around the cause of “no more school shootings” couldn’t have been a better demonstration of how kids are brought to life around a mission. After Parkland, many students have embraced the mission of no more school shootings, and it feels so refreshing to watch these teenagers lead the way on an issue. But for young people to have a mission is nothing new: my own brother, like so many college students, was arrested for taking over a college building as a protest to the Vietnam War. Young people were key in the success of the civil rights movement, as well as movements, successful and unsuccessful, all over the world, such as the Arab Spring and Tiananmen Square protests. And young people join the ultimate mission every day—and sometimes pay the ultimate price—by joining the military. These are great examples of big missions, but a mission doesn’t have to be flashy or public or big. But it has to be in service of something outside of the person: advancing knowledge, preserving something, helping people, animals, our environment…something outside of the individual. What is so compelling about a mission? All people, but young people especially, are hard-wired to connect to other people, and nothing connects people better than the working together toward a shared goal that is bigger than any individual. And when the connections are forged during an intense experience, they get even stronger. An extreme example of an intense experience would be the crucible of war, but that’s why so many treatment programs for troubled kids are wilderness programs and why wilderness programs are so popular for corporate retreats: they are an intense experience that force people to connect with themselves and others. Devices: Families or groups of friends may be in the same room, but they often are all on their own devices so aren’t actually connecting. Social media forces kids to be inauthentic: social media presences are, by their very nature, crafted to put forward an idealized individual, which is usually a far cry from the real person. It’s a struggle for any person to have to maintain a false self. But today’s kids struggle even more as social media and devices causes a 24-hour judgment cycle (expression courtesy of Coach Ryan Brown), so the pressure is intense for kids to live up to these crafted personae 24/7. Young people are already trying to figure out who they are; that is a normal part of growing up. However, that is, by definition, focusing inward. Having to present a false self on social media makes that even more complicated. It’s hard to focus on a mission, something outside yourself, when you are so confused by who you are on a basic level. The lack of unstructured play. Children have fewer opportunities to do things unsupervised with their friends. There is less pond hockey and more hockey leagues—the same with all sports. But think about it: when kids play a game, any type of game, on their own, they really get to connect. They have to solve problems, resolve conflicts…it’s all on them: coaching, refereeing, everything. They get to know each other and themselves. They motivate each other and call each other out. When kids were allowed to play on their own out in the neighborhood, they went on adventures, tested themselves, got each other in and out of scrapes. They really connected with their friends and learned a lot about themselves. Organized sports does very little of this, and kids lose out on a lot of opportunities for this important emotional growth. Outcome Fever. Teenagers today now often do extra-curricular activities for their résumés so they can get into a top-echelon college (whether that is the right place for them or not), not because they believe in the cause. Often, it’s because they are trying to please their parents, or, in some cases, are being actively pushed by their parents. Read more about Outcome Fever here. So we now have large numbers of kids who are confused about themselves and are trying to live up to the false personae they have put up on the internet. Kids who are way behind in learning how to connect with themselves, with their peers, or with adults. Kids who have never thought outside of themselves. While this makes finding and sticking to a mission tough for these kids, it makes giving them a mission even more crucial in order to make up for these deficits. One reason why athletics are so popular with kids is they have a built-in mission: when you play on a team sport, the team itself becomes that thing that is bigger than any individual on it. But the challenge for today’s coaches is how to imbue your team with that sense of mission; so many teams today are just groups of kids, because coaches often have trouble communicating with and motivating today’s “modern,” digital kids. The reason is because kids have to connect with each other, the coaching staff, and themselves before they can put themselves out for a shared mission. No amount of yelling (the old coach’s stand-by) will get those kids to connect; you have to reach these kids in different ways. But you have to reach them, because players today don’t bring those experiences automatically to the team; you have to teach them. Once you do, you will find players who are as dedicated to each other than kids were in the past. Actually, these kids end up being more dedicated to each other than kids were in the past, because having a mission, as well as people with whom they are truly, deeply connected, is such a relief, there is extra joy. And if you go the distance and channel that joy, you may have an over-achieving team on your hands. This is a big part of what I do with my team-building, but there are things you can do without hiring me. For instance, although it is easier to just tell a unit what they are doing wrong, it is good for them to put their heads together (after ungluing their smartphones from their fingers) to figure out for themselves what the problem is and, then, what they can do as a unit to improve the situation. Ditto for the weight room: it might be interesting to have each player talk in the group about what their strengths and weaknesses are in the weight room, have them set goals, both collective and individual, and see how units can work together to help each other achieve their group and personal strength and conditioning goals. But athletics are not the only mission: there are many missions out there. It could be saving lives. Or saving historic clocks. The pursuit of knowledge in a given field. Or expressing oneself to help others through an art, be it writing, music, or the fine arts, for example. But the same principles apply. One of the most fun parts of my job is to hear kids’ missions, and I encourage parents to be open (and non-judgmental when it isn’t what the parent wants) to hear what their child would choose for their mission. So many failure-to-launch 20-somethings I see are people who, when they were kids, were not allowed to become independent or choose their own destinies, which includes a mission. So it is no surprise they sit in their parents’ basement playing video games; what else do you do when you are disconnected from yourself and have no purpose in life? A mission-driven life is not just for kids. What is your mission? And I’m sorry, making sure your kids are successful is not an acceptable mission. Because kids look at what you do as much (maybe more!) than what you say, you really have to practice what you preach in this instance and model what a mission-driven life is all about. So what is your mission? What message does your life demonstrate? And no cheating: donating to worthy causes is laudable, but you have to put your mouth (and feet, and brain, and all of the rest of you) where your money is for you to call that a mission. What you will find, once your child finds a mission, is how content they become. (You might find the same thing happens to you when you get a mission.) Having a mission gets them outside of themselves, something that is increasingly difficult in this Digital Age, but is absolutely crucial if we want to avoid having depressed, anxious kids. It helps them with goals, and teaches them so many lessons that are going to make the difference in their success as adults. Do you know your kids’ missions? Why don’t you both agree to put your cell phones down, and then ask them? Or, if you’re a coach, ask your players what their favorite part of being on the team is. I bet many of them will say “the camaraderie,” and you can build on that to find your mission together.